Tour De Takong 2016 | JustRunLah! 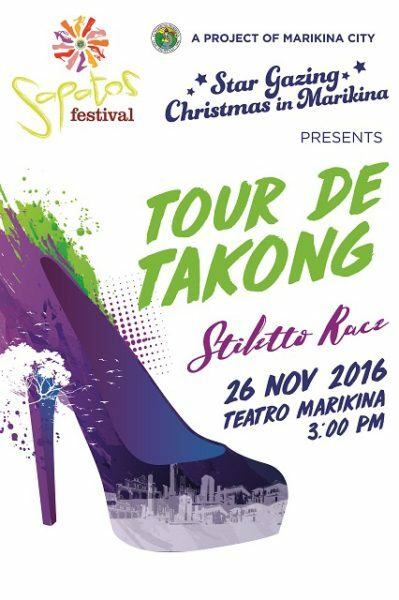 The Marikina City Stiletto Race “Tour de Takong” is one of the highlights in celebration of Marikina Sapatos Festival 2016. This year’s Tour de Takong theme is “Star Gazing” in line with the Christmas Festival in our city. Participants are encouraged to dress like a superstar or wear their uniforms according to their profession. Primarily, this event focuses on the stiletto shoes to test its durability and style. This event will also signify an opportunity to celebrate and recognize the triumph of women while calling and working for gender equality. It is also about surmounting challenges by focusing on what needs to be done to achieve gender equality by raising the consciousness and understanding of men on the plight of women and call attention on how society, economy and culture put women at a disadvantage.